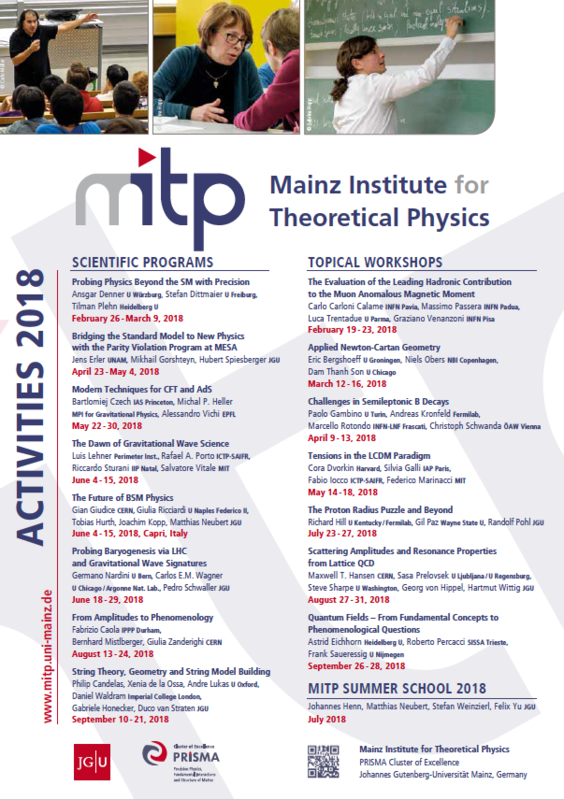 MITP workshop "Scattering Amplitudes and Resonance Properties from Lattice QCD"
In the coming years, experiments at Fermilab and at J-PARC plan to reduce the uncertainties on the already very precisely measured anomalous magnetic moment of the muon by a factor of four. The goal is to resolve the current tantalizing tension between theory and experiment of three to four standard deviations. On the theory side the hadronic corrections to the anomalous magnetic moment are the dominant sources of uncertainty. They must be determined with better precision in order to unambiguously discover whether or not new physics effects contribute to this quantity. Wer sind die Physikanten & Co.? 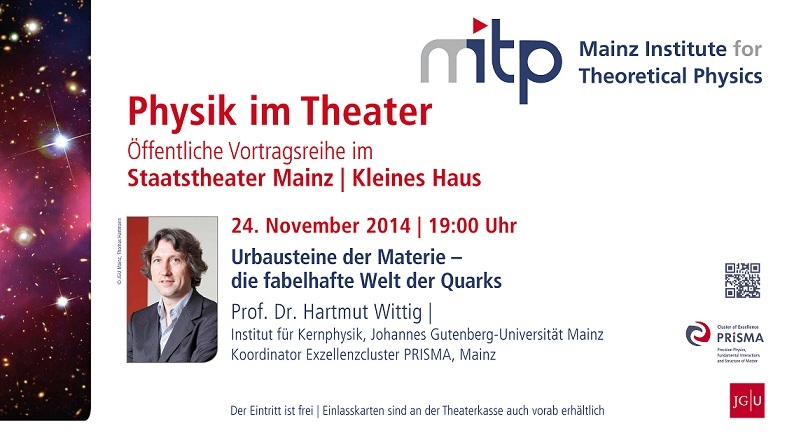 Die Physikanten & Co. sind eine Wissenschafts-Comedy-Gruppe aus Physikern, Comedians und Schauspielern. 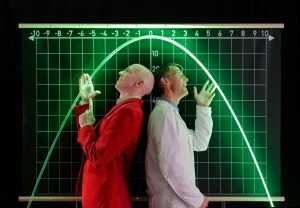 Mit ihren ebenso lehrreichen wie komischen Wissenschaftsshows begeistern sie seit zwölf Jahren auf Festivals, in Schulen, Museen oder Veranstaltungen in ganz Europa und Japan. Für Wissenschaftssendungen im Fernsehen konzipiert und baut die elfköpfige Gruppe um Gründer Marcus Weber spektakuläre Experimente. Wir bitten um Anmeldung von Schulklassen und Gruppen bis 12.12.2017. 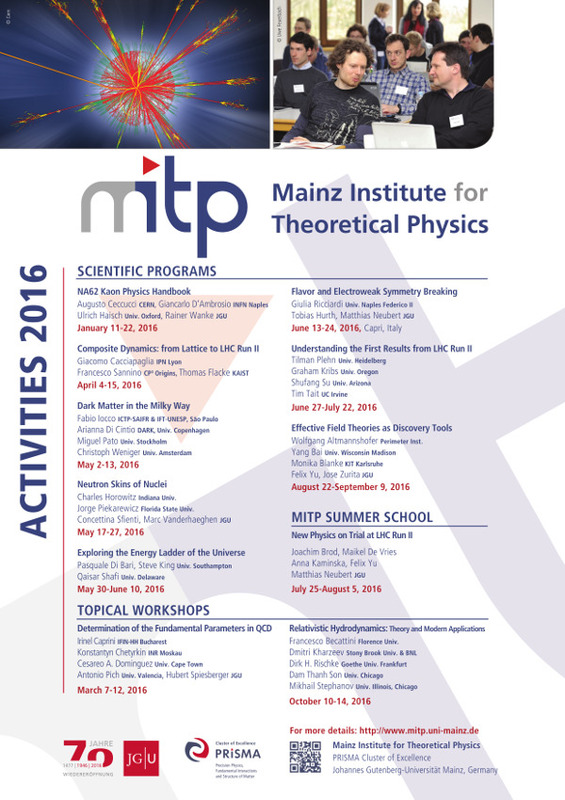 This conference series covers experimental and theoretical topics in the areas of nuclear and hadronic physics. It also serves as a forum for contacts and discussions of current and future developments in our field. The conference has unofficially been a counterpart of the US Gordon conference on photonuclear physics and held in alternate years with traditionally a strong US participation. 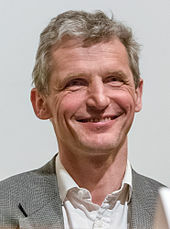 No proceedings will be produced, in the tradition of Gordon and Euroconferences, in order to encourage the frank exchange of even tentative information. 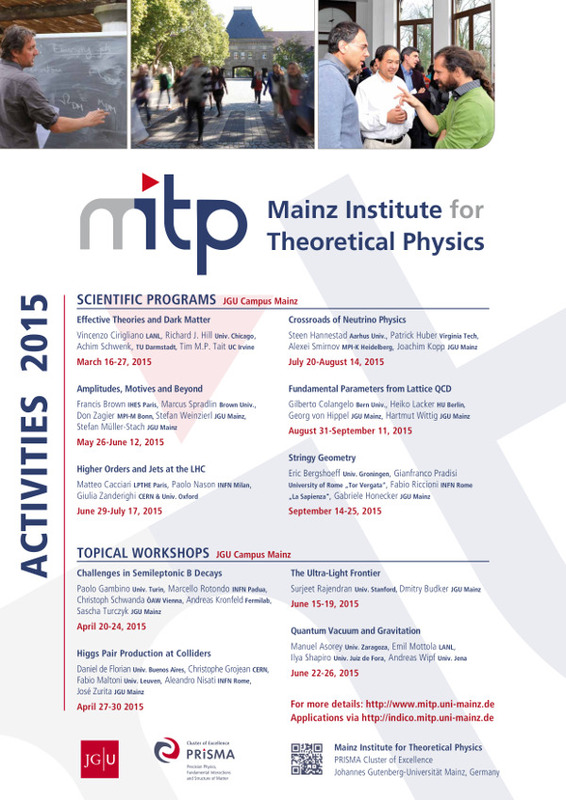 Summer School 2016 of the Graduate School "Symmetry Breaking"
Workshop "New Vistas in Low-Energy Precision Physics (LEPP)"
Summer School 2014 of the Graduate School "Symmetry Breaking"
An international summer school on the Chiemsee island Frauenchiemsee was jointly organized by the excellence cluster PRISMA and the Graduate School "Symmetry Breaking in Fundamental Interactions", with lectures and topical talks on Higgs and BSM Physics, LHC Physics, Effective Field Theories, Lattice QCD, Mathematical Physics, and Cosmology by world-leading physicists. 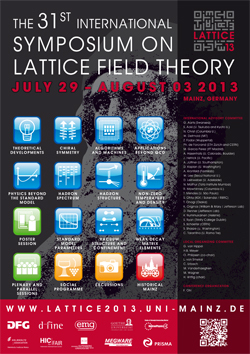 EINN 2013 - 10th European Research Conference on "Electromagnetic Interactions with Nucleons and Nuclei"
The 31st International Symposium on Lattice Field Theory will be held at Johannes Gutenberg University Mainz, Germany from Monday 29th July to Saturday 3rd August 2013. 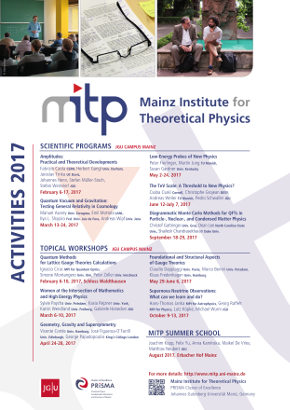 Organized jointly by Graduate School "Symmetry Breaking in Fundamental Interactions" and the Reseach Centre "Elementary Forces and Mathematical Foundations". 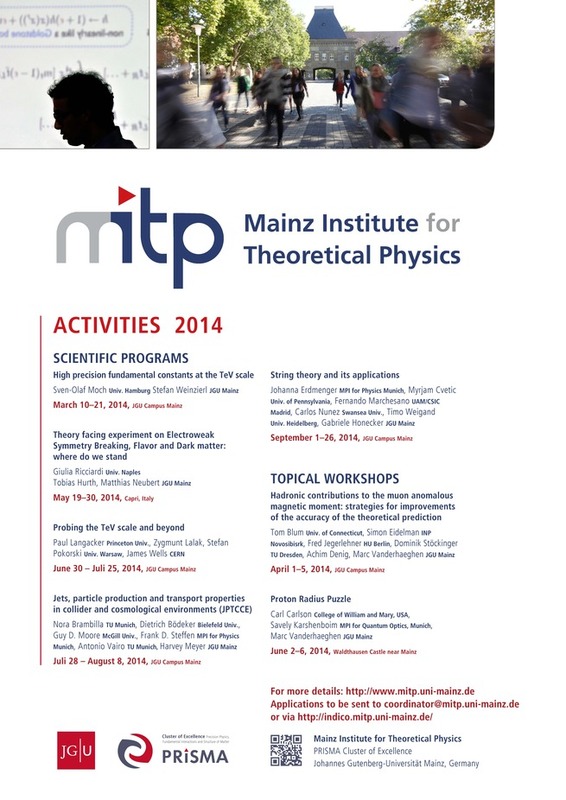 All fellows of the Graduate School and of EMG will take part. 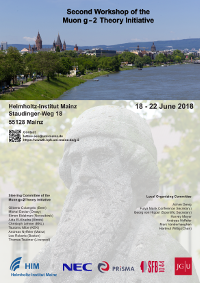 The Kick-Off Meeting of the CRC 1044 will take place at the "Kupferbergterrasse" in Mainz (Germany) from September 3 - 5, 2012. 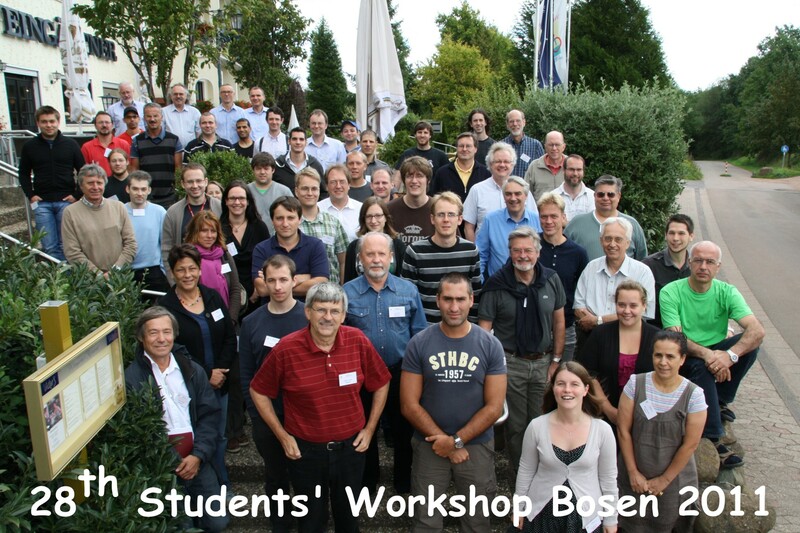 Summer School "Symmetries, Fundamental Interactions and Cosmology"
Dr. Geraldine Servant (CERN): ”Cosmo-astroparticle aspects of physics beyond the Standard Model"
"Der diskrete Charme der QCD - Numerische Untersuchungen der starken Wechselwirkung"